If you have car insurance in Maryland, you almost invariably have uninsured motorist coverage. Usually, your uninsured motorist coverage is the same coverage your liability coverage for bodily injury. Uninsured motorist coverage requires the insurance company to pay from the owner or operator of an "uninsured" or "unknown" vehicle for injuries from a car accident arising out of the ownership, maintenance, or use of the uninsured vehicle. 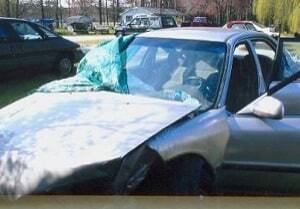 Maryland uninsured motorist statute: Section 19-509 is the most critical uninsured motorist law. This section, and the cases interpreting the statute, are the core of Maryland's law. This link takes you to that statute and Maryland appellate cases interpreting that statute. The thing to keep in mind is that the uninsured motorist policies are interpreted broadly by the law and Maryland courts. What this means to you is that common sense might tell you there is no way there is uninsured motorist coverage for your accident. But Maryland law may say there is coverage. It is also important to remember that you can get uninsured motorist coverage without having purchased insurance because of the way someone else's insurance policy is written. Maryland insurance policies also provide insurance for injuries caused by caused by hit-and-run or otherwise unknown (called "phantom") drivers who may have had insurance. Phantom drivers can include injuries caused by an at-fault driver who gives false information at the scene or otherwise cannot be located. "Motor vehicle" means a vehicle, including a trailer, that is operated or designed for operation on a public road by any power other than animal or muscular power. a taxicab as defined in §11-165 of the Transportation Article. "Motor vehicle accident" means an occurrence involving a motor vehicle that results in damage to property or injury to a person. "Motor vehicle accident" does not include an occurrence that is caused intentionally by or at the direction of the insured. Named insured. "Named insured" means the person denominated in the declarations in a motor vehicle liability insurance policy. The big news here is that buses and taxicabs are not included. Uber drivers are which is another good reason to join the 21st Century and use Uber. Single vehicle crashes: Can I still bring a lawsuit? Do victims need car insurance to bring a viable claim?